Wonderful things come in small packages, I always say! This month's release at Verve Stamps is a mini one, but no less fabulous! How darling is this sweet Christmas bird that Julee Tilman created?! He is the sweetest little thing, whether you color him, leave him plain, or paper piece him! 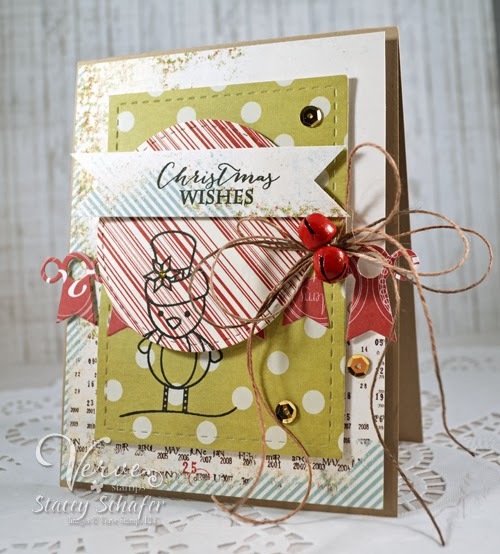 The fonts in this new Verve Stamps set, Christmas Joy, are beautiful, with a mix of block print and script! There's a little more Verve goodness on my card...the "must have" Award Banner Trim Die! Brand new Verve releases today and we're celebrating with a blog hop! Hop along to each of the blogs below to see a little inspiration with the new stamps, then be sure to head on over to the Verve Store to check out Verve's Thanksgiving Sale (25% off all stamps & dies) that starts today! Want to win some shiny new Verve? We'll be picking a random commenter on one of the hop spots below to win a $75 gift certifcate to Verve! Comment deadline for the prize drawing is Sunday, December 1. 1. Julee 8. 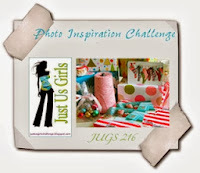 Laurie W.
The Monday Mojo Sketch Challenge #321 and the Just Us Girls #216 provided the inspiration I needed to whip up this Christmas card! Now, I need to start addressing the holiday cards I've been making and getting them ready for the mail! I've been drooling over some of the girls' use of jingle bells on their Christmas cards and projects, so when I was at Jo-Ann's this past weekend I grabbed a few bags of them! Love these red ones...a great pair up with my favorite twine! Thanks so much for stopping by the stage! Enjoy the hop! Liked how it's stitched, nice card! Lovely card! Love the twine bow with your sweet red jingle bells! Wonderful new releases! Yay! Great dimension on your card - love all the layers! Your card is so beautiful, love the design of your card. Thank you for sharing. Beautifully put together!! That little guys is such so darn cute!! Also love your red jingle bells!? What a fun and festive card! Love those red jingle bells! Wonderful mix of papers and love the bells and how you stamped the bird image. Too cute! Love the colors you used and the sweet bird!! Love all the layers on your card- very clever! Love the red bells, and thebow treatment. Sweet, sweet card! I LOVE your card design. The bells are just the right added touch. TFS. Such a cute card Stacey--Love it! Happy Thanksgiving, Stacey! While Canadian Thanksgiving has long passed, I'm happy to celebrate 'vicariously' with my friends in the US. Thank you for sharing your creativity and talents with all of us! LOVE your card; another fabulous new release that you've showcased beautifully! This is really cute!! I like the little bird stamped onto the two layers of paper. It really gives a unique look. Love your card Stacey. The big twine bow is perfect. So cute! Love your papers and how you chose to just stamp the birdie. Happy Thanksgiving! What a fun Christmas card! That is the cutest little bird. He's stolen my heart! Oh my word, this is darling, Stacey! And that twine/jingle bell treatment rocks my world! Absolutely fabulous, girl! Happy Thanksgiving! The papers you used are so pretty! I love the big twine bow! Great card! Love the papers and how you stamped the cute bird! Very creative! I have jingle bells on my shopping list for this weekend! Very cute. I like the jingle bells and how you stamped the bird. Very cute inspired card! Love the added bells too~ Thanks for joining in with JUGS! UBER CUTE!!!! I have jingle bell envy too :) I need to find some - they are adorable on projects! WTG! I really like this card! I'm sure seeing a lot more Verve products that I "need" to have. This is adorable and love the mix of papers along with the elements, ribbon twine, and jingle bells!! Too cool! Love this...the papers are amazing! Cute card! I love the twine with the jingle bells and the scattered sequins. Thanks for playing with us at JUGS! Fabulous card! Love the added bells! Loving all the layers and those red jingle bells are so sweet! Cool layers and the stitching adds a great finishing touch. Well done. What a clever way to stamp the cute little bird! Love the jingle bells, too! Love the fresh look the striped papers bring. Really cute card. Cute card! I have some of the same paper and couldn't figure out what to do with it - thanks for inspiration! Love the way you stamped the bird like that. The jingle bells are great too! Makes me want to get some and try them out. Love all of the layering. Cute to stamp the bird over two different pieces of paper. Great job. Love this Stacey! The big twine bow is amazing. Cute little birdie. Love the way you stampedit. I have loved seeing how each of you did it differently. And I agree the fonts are great on these new sentiments. Great ideas on this card - I love how you showcased the cute image and your layers and details are fabulous! Nice card! So much interest...and I love the papers!